800BC: The Tartesses culture develops in Western Andalusia influenced by the Phoenicians and Greeks with whom they traded commodities including oil, textiles and metals. 200BC: Spain comes under the rule of the Romans after defeating the Carthagins in the Second Punic War. 400AD: The Vandals invade Spain from Germany. Much havoc and destruction is wreaked in their wake. 466: The Visigoths invade Spain from Gaul after being pushed out of their homeland by the Franks. 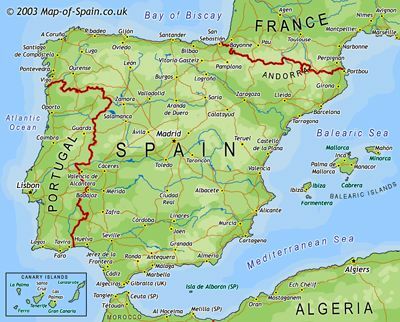 711: Muslims invade Spain from North Africa. General Tariq ibn Ziyad commands an army of 10,000 Berbers who land on Gibraltar. 756-1031: Cordoba flourishes culturally under Muslim rule. Palaces, universities and gardens are built. Agriculture is developed. 1248: Fernando 3rd invades Seville forcing the Muslims to retreat. 1478: Queen Isabel and Fernando set up the Spanish inquisition in 1492 under the supervision of the Catholic Church. Jews are ordered to be baptised or leave Spain. Many Jews flee from Spain leaving a shortage of educated and skilled people. 1517: King Carlos 1st becomes the first Habsburg king of Spain. Carlos is also king of Austria, much of Italy and the South American colonies. Carlos rules until 1556. 1702: The war of Spanish succession in which Spain loses Gibraltar. 1805: The Spanish naval fleet is defeated by Lord Nelson at the battle of Trafalgar. The Spanish fleet is hugely diminished and Spain never regains naval power. 1808: The French army occupies Spain under the command of Napoleon who puts Spain under the control of his brother. The Spanish people revolt and force the French to retreat in 1813. 1936: The Spanish Civil War. 350,000 people in Spain lose their lives in a war between right wing nationalists and Spanish republicans. 1939: General Franco assumes power. He rules Spain as a dictator until 1975. 1975: Spain begins a transition to democracy for the first time in its history..